Here is Barbara at our 2005 show and two of her wonderful pieces that were available. 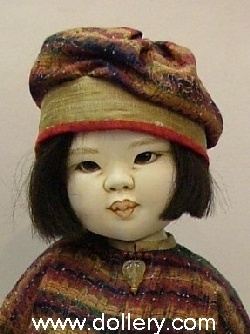 Feel free to contact Kim at kmalone@dollery.com or 781-447-6677 for further details on Barbara's work. 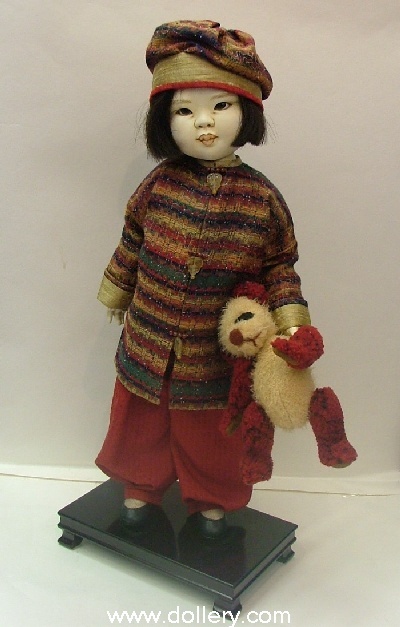 Barbara has a wide variety of dolls she is capable of making from Jesters to these wonderful pieces in La Doll. Barbara Vogel at our 2005 Doll Show! Ning means peace in Chinese. She wears a finely detailed eggplant colored Italian silk with vintage trims on the hat and outfit. The eyes are hand made and hand painted. The faces, arms and legs are painted with oil paint. She uses all natural fiber fabrics and trims many of which are vintage. Black Human Hair, Brown hand painted eyes, 21"